The ‘Space Race’ between the US and the USSR during the 1960s can kind of be looked at as a sport. The Russians took a huge early lead, being the first to successfully launch a satellite; put an animal into space (poor Laika); and, as an almost ‘nail in the coffin,’ sent famed (and consequently doomed) cosmonaut Yuri Gagarin into orbit. All the US had to offer was to launch astronaut Alan Shepard into sub-orbit; he was in the air for less than half an hour. But this massive rocket the Soviets built turned out to be their downfall. With the successful Apollo 11 program, the US did what was needed to win what in hindsight seems like a bizarre and macabre game. The Saturn V carried Neil Armstrong, Buzz Aldrin and Michael Collins to the moon for the first successful moon landing. Where were the Soviets? While Neil and Buzz were sauntering around and playing golf on the moon, the USSR was doing what they love most: Being secretive. They designed and built a rocket called the N1, a shuttle slightly shorter than the Saturn V but with much, much, much more fire power…too much, it turned out. 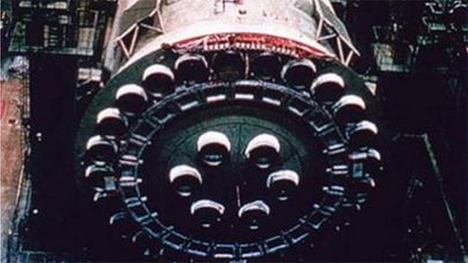 The American space program strapped five huge engines on the Saturn V; the Soviets went the other route and used an astonishing thirty engines. Although they were much smaller, 24 of them were assembled into a ring for the first launch stage. Their logic seems similar to the kind used by the crazy uncle we all have who, during a July 4th celebration, thinks it’s a good idea to put two or three superfluous mortars into the firing tube. 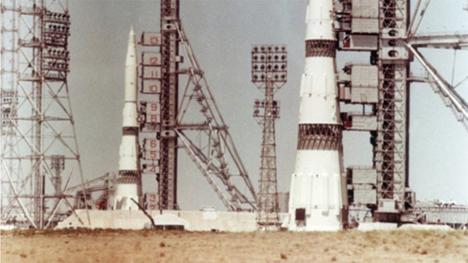 The USSR executed four test launches of the gargantuan N1. All were disastrous, especially the mega-blaze of glory that was the second attempt. Subsequently scrapped, the program was denied until 1989, as it was seen as a huge embarrassment. See more in Epic Failures or under Vintage & Retro. November, 2013.